Adventures in Guided Journaling: Moving right along . . . 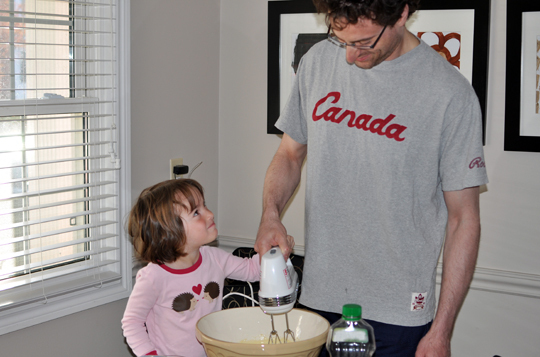 It's a fairly unremarkable photo, but it was a Saturday morning and they were baking together (one of her absolute favourite things to do) and that's her artwork and her sister's, up there on the wall behind them, and there's just something about the way she's looking up at her dad. That's what it's all about, says my heart. That's why I've stopped by today, after yet another lengthy absence. To talk a little about the pace around here. Slowed right down, hasn't it? Every once in a while when I read up on what I'm supposed to be doing, blogwise, the primary rule always seems to be to post regularly and often. That makes perfect sense to me. The bloggers I love post regularly and often and it's a treat to be able to follow their lives and projects. I can do that -- post somewhat regularly -- for short stretches, but deep down, that's just not me. I'm up and I'm down. Quiet then chatty. Settled into a happy routine with the little ones and then thrown completely off for days at a time. It's rarely smooth sailing in my world, a fact to which the husband can attest, and for better or worse, my blog is a reflection of that. And so, on top of my own odd quirks, we are now embarking on two summer months, during which my time and energy, like so many of us, will be pulled in all sorts of wonky directions. In journal page news, I wanted to let you know that it's going to be a slow summer. I plan to post one new page mid-July and another one mid-August. Beyond that, changes are coming. Our youngest starts school in the fall and I've got a few plans for this space -- a new name to take for a spin and new design formats to add to the tried and true. Until then, there will be much splashing and laughing, and sunscreen and bug spray, and family and friends. See you in a few weeks with journal page 45.
awww, those pictures are sweet. Christie do what you need to do. Your family and your own well being come FIRST! I hope that you enjoy your summer with the kiddos and hubby first and foremost! Enjoy! What? Isn't everyone quiet then chatty? Can't imagine it's just you and me. The love in the first photo (as well as maybe, "Let me do it by myself, Dad"?) makes me want to hug them both. 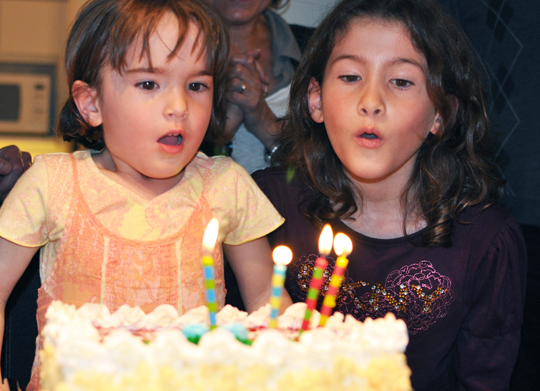 And I love the awe and preparedness of the birthday girl and her sister. Enjoy the wonkiness of summer! Can't wait to see the changes that are simmering. Your loyal readers will still be here - it's quality, not quantity. I am the exact same way. My blogging definitely ebbs and flows. Maybe it's the bipolar in me, lol! Enjoy these splendid summer days. Snow will be flying soon enough and you'll have plenty of time to sit in front of the computer. I've always thought that the daily blogging etc was, well, overrated :) Quite frankly, I have unsubscribed from many blogs that simply posted too frequently for me to keep up with. Like Roxann said, quality not quantity is my mantra. Blog when and how you want -- it's YOUR blog! that first photo is so previous! I appreciated this post a lot. your words, "I can do that -- post somewhat regularly -- for short stretches, but deep down, that's just not me. I'm up and I'm down." describe me to a T.
... we didn't feel the need to excuse or explain the frequency of our blogging? You know... each time that I see a new post from you, I feel happy because I know it will either be a journal page (which I love) or, and sometimes I love this even more, it will be some genuine sharing of yourself or your life. To me that genuine sharing is a treasure. I value it so much and it's a balm to my spirit in this increasingly impersonal world. And it means so much more to me when I know that you did it when the time was right, when you felt drawn to - not 'supposed to'. I just wanted to thank you so much for the time and effort you put into these amazing pages. It may not seem like much, but I really love them. I'm heading up a major family history project in my own family, and I love to share these pages with my siblings and parents. So, thank you.